My mother is blind, she raised her children knowing that they may also end up blind. In my family, there is a hereditary disease: Retinitis Pigmentosa. I do not write this to garner sympathy, simply to state a fact that had an enormous impact on my childhood. My mother raised us to always be aware of all 5 of our senses, and not to be reliant on the single sense of sight. As a child, I remember being encouraged to close our eyes and breathe in the aromas that surrounded us. To listen carefully to the symphony of natural and supernatural sounds that surrounded us. To caress the bark of a tree, or squelch our toes through the mud on the riverbank. To savour the flavour of my grandmother's freshly baked shortbread. Today my relative fame as an international storyteller has been built on this very simple observation; ‘that we experience the world with all 5 of our senses’. Nowhere is this more evident than in the telling of scary stories. By using all 5 of our senses in the telling of scary stories we build tension, accelerate emotion; creating connectivity and resonance. Although this may sound obvious, it is not surprising that those who have grown up in a media-rich environment tend to describe their world largely in terms of what they see. In our writing and our storytelling, it can take a conscious effort to refer to all 5 of our senses. 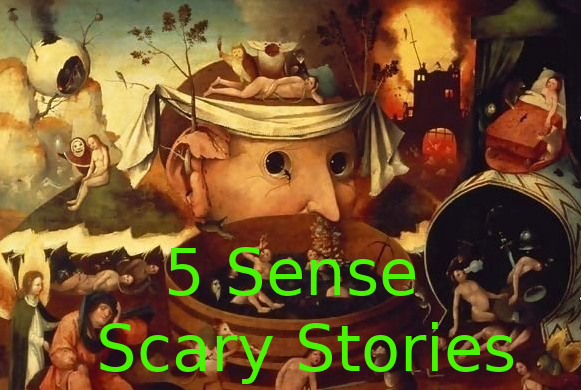 For an example of how this can work here is a short video snippet of a horror story that I tell, watch for the use of the 5 senses to build tension and excitement. If you are writing or telling stories this Halloween, try adding some extra senses to what you tell. Talk about the sounds, smells, tastes, and feelings of your environment, and see your story improve.